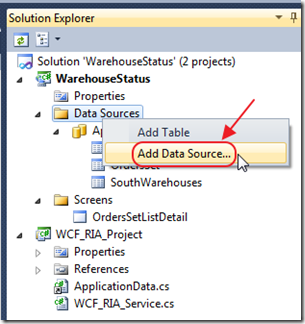 LightSwitch is a powerful application builder when you use WCF RIA Services and Silverlight Custom Controls (or Silverlight Control Extensions). Otherwise, it is merely just a fast and easy application builder. In order to be fast and easy, LightSwitch has it’s limitations. However, when you employ WCF RIA Services and Silverlight Custom Controls, you are able to overcome any limitations. When you use WCF RIA Services and Silverlight Custom Controls, there is nothing that LightSwitch cannot do, that you could do with a normal Silverlight application. The http://LightSwitchHelpWebsite.com site has a number of articles on Silverlight Custom Controls, this article will concentrate on WCF RIA Services. Note: You must have Visual Studio Professional (or higher) to create WCF RIA Services using the method described in this article. 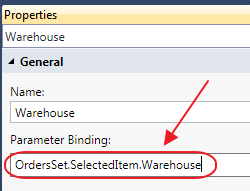 This may not seem like a difficult requirement, except when the status for each warehouse is in a different table, and each table has a different structure. LightSwitch is able to handle this situation, just place each Entity (table) on the screen using a Tab Control, and allow the user to switch between the Tabs. With a little programming, you may be able to automatically switch between the Tabs based on the order being viewed. This solution, like many “out-of-the-box” LightSwitch solutions, eats up a lot of “screen real estate” (also, if you have a lot of warehouses you would eventually run out of room on the screen). Furthermore, a big complex user interface is difficult for users to learn, and time-consuming to use, because the users have to switch between screens and Tab containers. We create a new LightSwitch application. 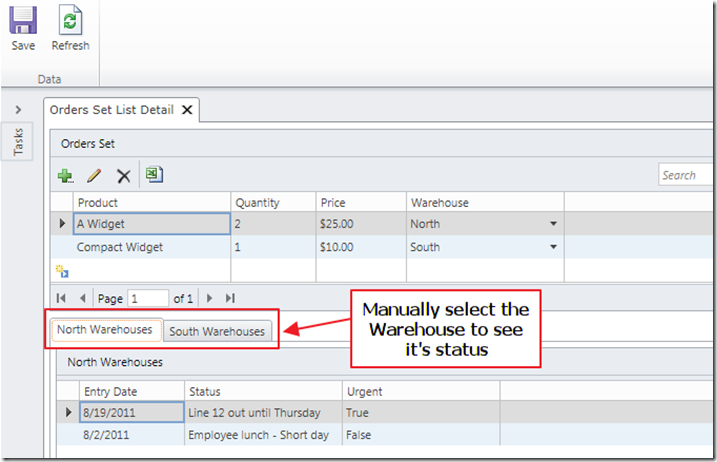 We create two different Entities (tables) to hold the status of each warehouse. Notice they have different structures. In the “real world” we are faced with situations like this (perhaps each warehouse uses a different application to report their status). 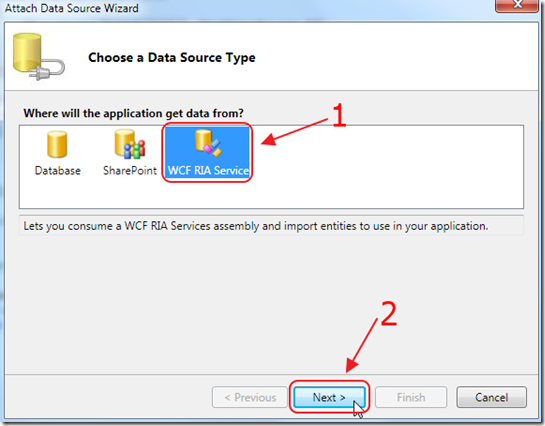 Yes we could create a SQL Server View to tie the two Entities together, but a WCF RIA Service will also allow you to update the data if you needed to. 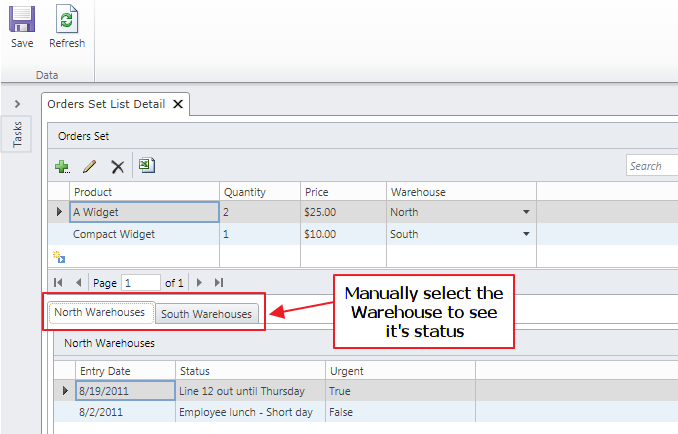 When we complete the application, the user is able to manually switch tabs to see the status for the warehouses. However, what if there were dozens of warehouses? We follow the directions, to create a WCF RIA Service, in this article: WCF RIA Service: Combining Two Tables. 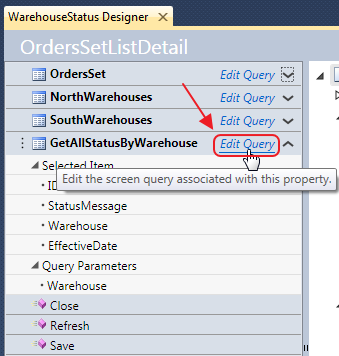 Yes this method could also be called by normal LightSwitch code that uses normal Linq queries, however, we will demonstrate how to make a method that takes a parameter for those cases where you must have a method that takes a parameter, such as when the method calls a stored procedure. First, we build the WCF RIA Service project (ignore any warnings you may see in the output window). Next, we add the new Data Source. We select WCF RIA Service. Note, you may have to wait up to a minute for the Service Class to display in the list box. Select the collection and click Finish. 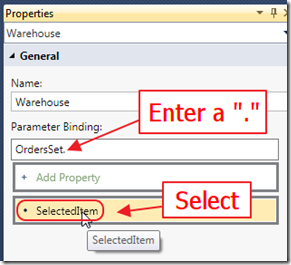 The Entity (table) will display. It will also display in the Solution Explorer. Also note that the method that takes a parameter (GetAllStatusByWarehouse) also displays. 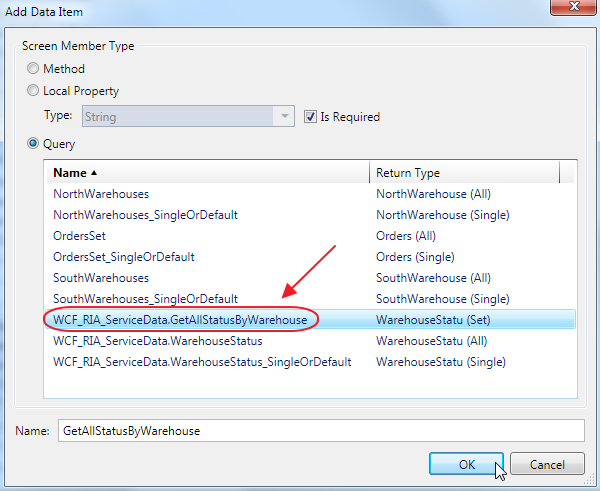 LightSwitch treats the GetAllStatusByWarehouse method as it would any other Pre-process Query, the only difference is that you cannot edit it in the normal LightSwitch editor (you must alter the code in the method in the WCF RIA project). … and select the GetAllStatusByWarehouse collection. When it is added to the Screen’s collection (the Screen’s View Model), it indicates that it has a parameter that must be supplied. 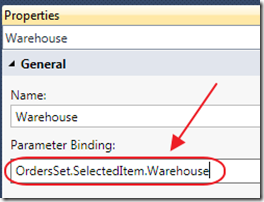 We can click on the parameter and in the properties for the parameter, bind it to the SelectedItem in the Orders collection. We select the Warehouse field. … and set the Sort. 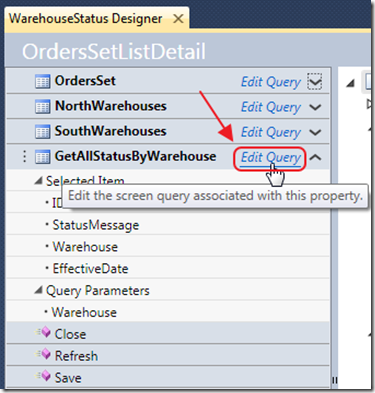 We could also set additional parameters to constrain the query. At this level, LightSwitch treats this data source as it would any other Entity. When we run the application, we now have a user interface that will automatically show the status for the proper warehouse. If you avoid using WCF RIA Services with LightSwitch, it would be like buying a sports car and never going past 3rd gear. LightSwitch was designed to be used with WCF RIA Services. This is what allows LightSwitch to be used for professional applications. You may decide, “I will just use FindControl(“MyTabControl”) and automatically switch Tabs”. The problem you will face, is that if there are any errors, you will not find them until the application is running (meaning you may never find them, your end-users will). If you use the methods described here, any errors will show up at “compile time” (meaning the application will not run and it will show you exactly where any errors are). In addition, the methods described here require LESS code than it would if you used another method. It seems that the RIA query can only take a String as a parameter. Anything else, I get and error which attaching the RIA service to the LS application, say that the parameter must be nullable. Did I do something wrong? @CT - You can also pass a nullable integer or a nullable bool and perhaps other nullable primative properties. Ha! This is what i've been trying to do. But my is supposed to have a button for invocation. That is you click on a button and the method is call. could be wrong or long. 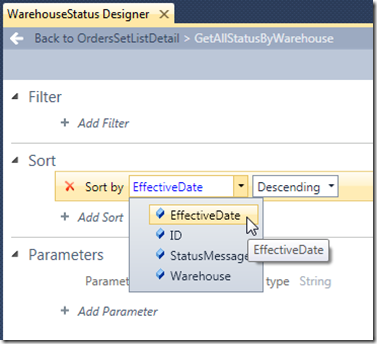 All i want to do is call a stored procedure from my lightswtich - when click a button or do some action to invoke it. 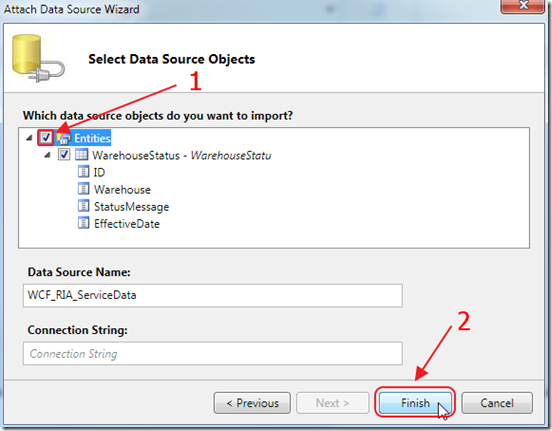 Then i could fetch my data (result of stored procedure) some other way possible. 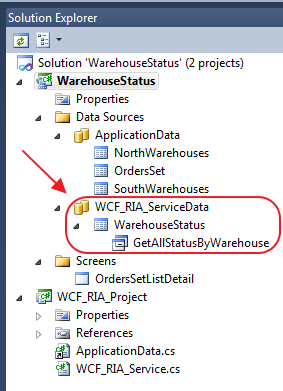 Rather than connect a Lightswitch app directly to a WCF RIA Service is it possible to hook up a Silverlight User Control to a WCF RIA Service?This way the uc can be imported into any lightswitch app / screen and consume data without any tweaking of LS apps? what can i do if the paramater in this ria services should be optional? in my application the user only somtimes wants to filter the information in the query. what if the audience and district are parameters that i dont all the times want to filter by? 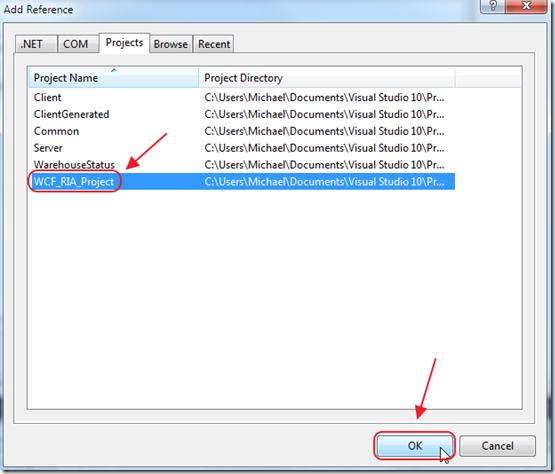 the only thing i always what to filter is ths date..
With Visual Studio LightSwitch 2012 you must make sure your WCF RIA Service is ".NET 4" NOT ".NET 4.5"
I followed your instructions on creating a WCF RIA service in LightSwitch. 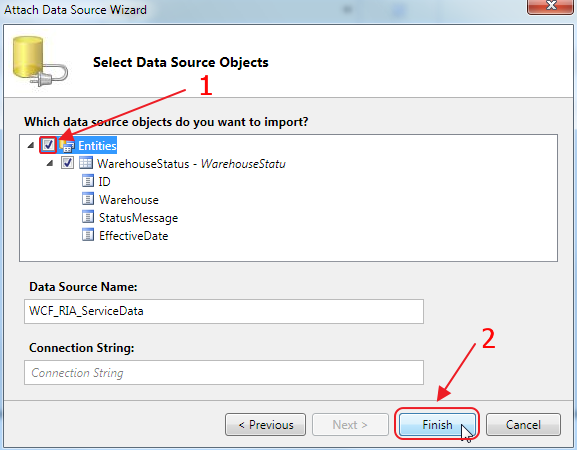 In my project I work with an Oracle Database with an ADO.NET Entity Data Model. Some data in the Oracle database gets updated by the database itself (trigers), this creates a concurrency problem. That's why I had to set up the WCF RIA service to overcome that problem. Lucky I found the way to get it working, with help from you ;-). 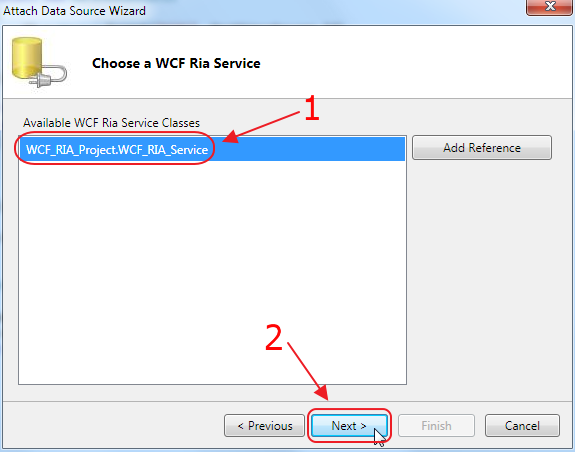 - The WCF RIA project has to be .NET Framework 4. - The created .tt files in project have to be deleted. 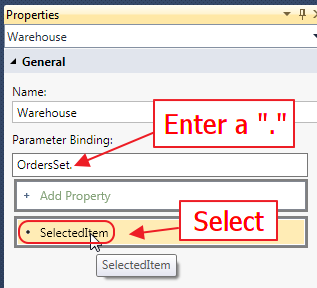 - In the properties screen of the .edmx file/part the "Code Generation Strategy" has to be set to "Default"
- In the .edmx file/part select a field from a table that will be update in the database and set in the properties screen the value of "StoreGeneratePattern" to "Identity" (for the Id) or "Computed" for the other fields. This garanties that the data of that field in the database will be returned to the screen collection, on an insert or update action. Otherwise you get an error message like this "The context is already tracking a different entity with the same resource Uri." The reason for this error was that the new added entries had a Id = 0. I hope others can do something with this extra info. @Norbert Kramer - Thank you for the answer to the "The context is already tracking a different entity with the same resource Uri" error. I got that error recently and I googled it and hit your comment. 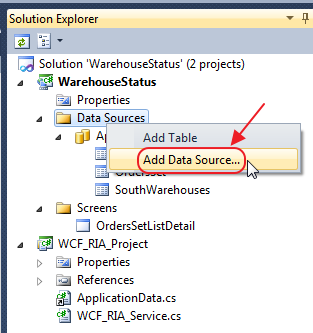 In my case I create a unique ID in my WCF RIA service, but in my screen behind code I must explicitly set a unique ID when I create the object that will later be passed to the WCF RIA Service insert method (this value will then be overwritten with the unique counter ID in the table of the underlying database). We want to deploy WCF RIA Service and the Lightswitch application on two separate servers. 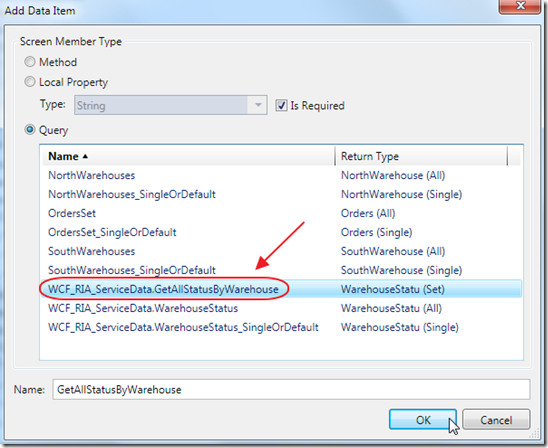 How to we modify LightSwitch application so that it can pick up the location of the WCF RIA Service? Hi Michael - I did, please use below link for my post - any help will greatly be appreciated; been at this for days now. 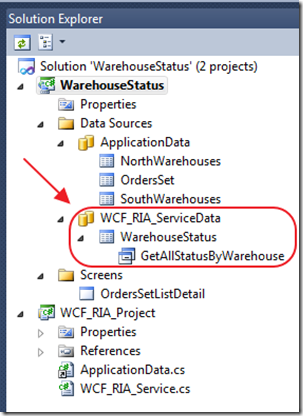 When building a WCF RIA service I am using VS2013. 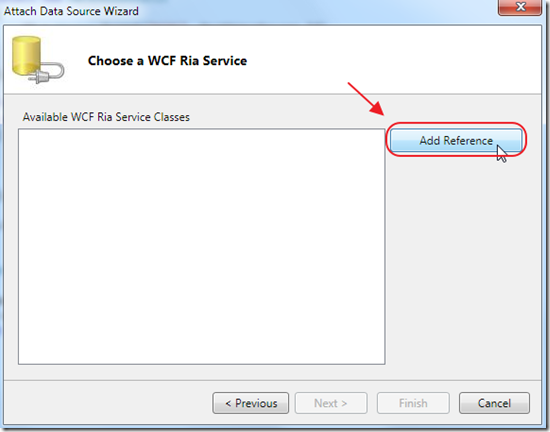 Do I still need to create the WCF RIA Service as a "4.0" framework or can i use "4.5"? 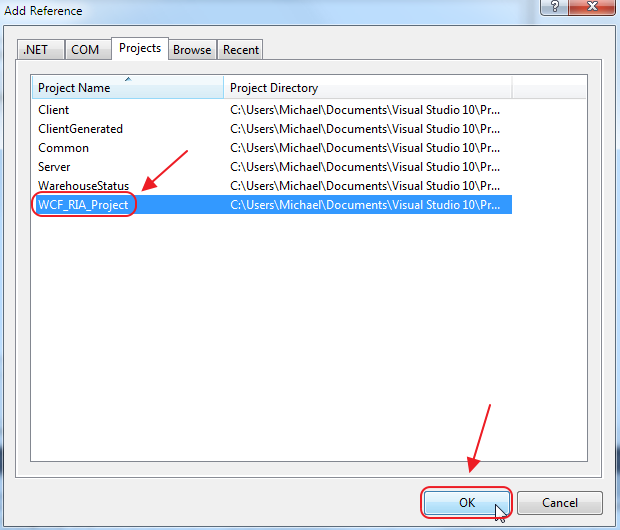 The above comment mentions using 4.0 but it is with VS2012. I wasn't sure if VS2013 can now use 4.5.